Be properly prepared as the role of the trainer evolves and more is demanded of your talent and time. The ATD Master Trainer™ Program is a unique assessment-based certificate offering that covers the entire process of delivering training, including: assessment, preparation, creating a positive learning environment, facilitating learning, and evaluating learning. Founded in theory and focused on practice and application, this program will develop your professional capacity in this delivering training area of expertise. You will have the opportunity to prove your ability, and give you and your organization a competitive advantage. Tailor your learning. Prove your ability. Deliver the most engaging and effective training. 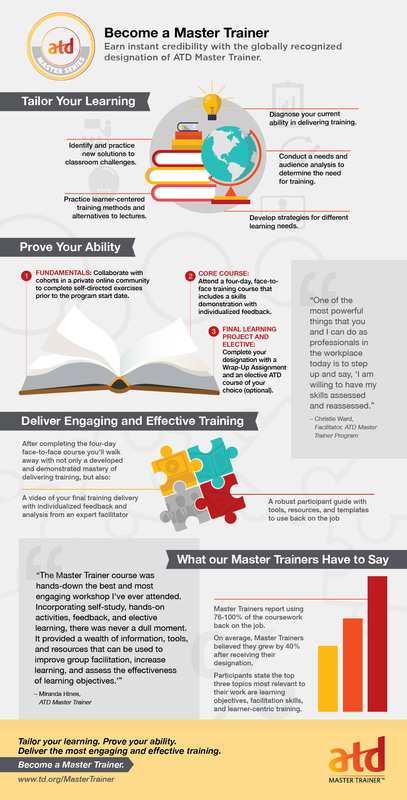 Become an ATD Master Trainer™, click on the below for more details on this designation. Tailor your learning. Prove your ability. Deliver the most engaging and effective training.